Chandigarh, India — The Mahabodhi Temple in Bodhgaya, India, where the Buddha found enlightenment after years of wandering in search of truth, was formally dedicated as the Unesco's World Heritage site, in February, 2004. The Buddhists' most sacred place, in the Indian state of Bihar, this 170-feet-high temple stands majestically in the form of soaring slender pyramid on a base of 48 square feet. Built about 1,500 years ago, this architecturally beautiful temple attracts Buddhist pilgrims from world over, besides a large number of tourists interested in history and Buddhism. Hiuen Tsang, the Chinese traveller who came here in A.D. 637 was impressed by this awe-inspiring structure and gave a lively description of the temple. Its past glory has not been lost due to the ravages of time, nor its attraction as a pilgrimage center ever decreased. A number of renovations have been carried out since Emperor Ashoka's time. As one of the holy places related to the life of Buddha, the UNESCO declared it as a World Heritage site in 2002 but the site was formally dedicated last Thursday in a ceremony where the lamps were lit, drums were beaten and Buddhists monks chanted special prayers. 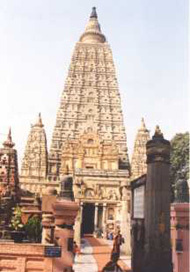 The temple, which belongs to the Gupta dynasty and subsequent ages, stands east of the Bodhi tree under which the seeking prince attained Enlightenment. The present Bodhi tree is probably the fifth succession of the original tree. It is said that sapling from the original Bodhi tree was carried to Sri Lanka by Emperor Ashoka's daughter. 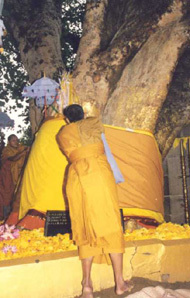 From the tree that now flourishes there, a cutting was carried back to Bodhgaya when the original tree died. On the temple's northern side you can see Chaukramana (cloister walk). The Buddha is said to have strolled here in meditation, pondering whether he should reveal to the world the enlightenment he had received. As Buddha spent the third week after attaining pious enlightenment here, walking up and down and meditating, it is believed that wherever the Buddha put his feet lotuses sprang up. Besides the temple, is Mucalinda Lake (the abode of Snake King). Lord Buddha is believed to have spent the sixth week in meditation here. A thunder storm broke out while he was meditating. To protect him from the violent wind and rain, the creator came out to protect him. A large number of stupas of various sizes and designs dot the courtyard of the temple. These stupas were built by the pilgrims and devotees. Some are 2500 years old. These elegant stupas lend the place a serene ambience. 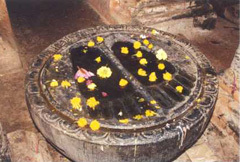 You can also see Buddhapada, footprints of Lord Buddha, engraved in a circular stone. A number of monasteries in the vicinity of the Mahabodhi Temple reflect the reverence of various Buddhist countries like Thailand and Japan in their colourful designs and structures. But the site not-to-be-missed is "The Great Buddha Statue" built in 1989, and unveiled by His Holiness Dalai Lama. 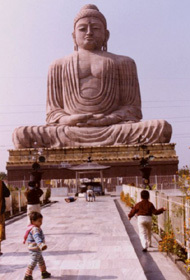 The 64-feet Buddha Statue is in dhayana mudra (meditation pose), seated on a lotus in the open air. The statue is a patchwork of blocks, red granite stone and sand stone. It took four years to complete it. The giant, impressive statue was constructed with the efforts of the Daijokyo Sect in Japan. "With the World Heritage status I hope the upkeep of this historically important and the most revered places for Buddhists would certainly improve," says Thich Nhat Tu, a Buddhist monk from Vietnam, visiting Bodhgaya to celebrate the dedication ceremony at the Mahabodhi Temple. The Indian tourism department is already excited and expects the international tourist inflow to increase in this area following the temple's heritage status. The Indian civil aviation ministry has plans to upgrade Gaya airport to international standards, and international airlines will fly here. The Mahabodhi Temple, considered one of the India's oldest existing temples, from where the Buddha after attaining enlightenment set out to his life of preaching continues to spread the Buddha's message of unconditioned compassion and peace for all beings. A rich heritage for the modern humanity indeed! Dr. Manpreet Singh, who serves as a contributing writer for The Seoul Times, is a freelance journalist and photographer in India. He has published a number of articles and photos in Indian and international newspapers and magazines.